If it’s not moving, monogram it, right?! I’ve been on a little bit of a crazy monogram/glitter kick lately, and these DIY glass glitter ornaments are hands down my favorite holiday project so far. They’re so gorgeous, and they look like they take hours to make, even though the process is so quick and simple! I’ve actually been wanting to make a batch of DIY glitter ornaments for the past few years, but I had no idea how to handle the monogram component. Enter: Cricut Explore Air 2. This machine, y’all– I tell you what. It can do some incredible things, including Cricut monograms! Keep reading to learn how to make glitter ornaments with polycrylic and how to make monograms on the Cricut! Step 1: Coat each ornament with polycrylic. Pour a small amount of polycrylic into each glass ornament and swirl it for a few minutes around until the inside of the ornament is completely covered. Then, let the polycrylic drain back out into the can. This step is very important for getting even glitter coverage. I basically ruined the first few by leaving too much in, so hopefully this’ll save yours from a similar fate. 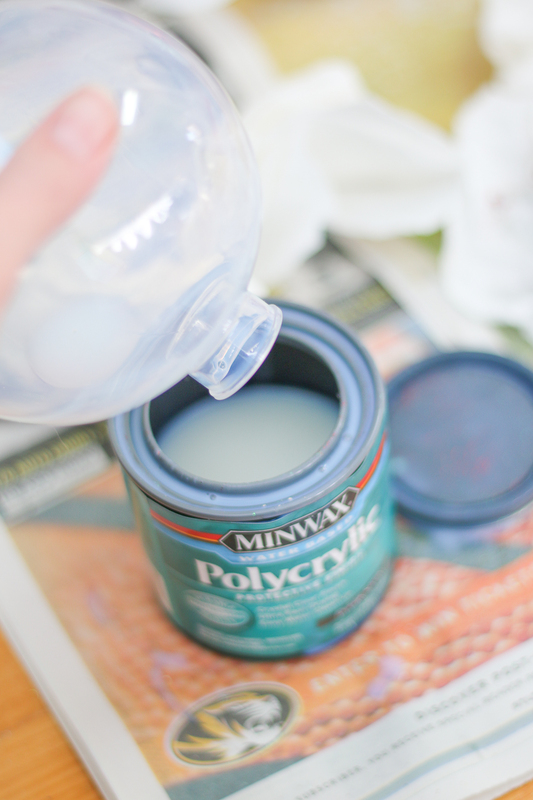 I’ve heard you can make DIY glitter ornaments with floor cleaner, but making glitter ornaments with polycrylic is so easy– and you can keep reusing the same can of polycrylic over and over! Grab your extra fine glitter and pour some into each polycrylic-coated ornament. I used a paper towel to block the opening and then shook the glitter around like crazy. If the coverage looks uneven, add more glitter as needed. Allow to dry for a bit before replacing the top. Fun note— if you look in the photo below, you’ll see the two white ornaments I ruined by not draining the excess polycrylic. The glitter clumped in certain spots and created what looked like unsightly stretch marks on the glass. Step 3: Create your vinyl monograms. While your DIY glitter ornaments are drying, create your vinyl monograms. 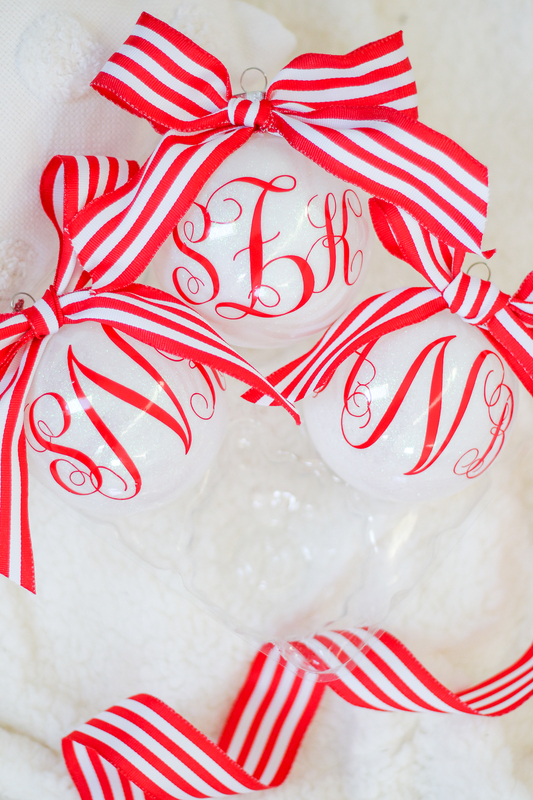 Open up Design Space, choose your fonts, and resize to fit your ornaments. Keep in mind that there are a few different formats and styles for monograms. I like the more formal ornate look, so I used a font called Monogram KK. I typed each monogram in the first initial/last initial/middle initial format, un-grouped the letters, and then re-sized and rearranged the letters so that they overlapped evenly. Then, I welded the result together and clicked “Make It” in Design Space. So easy! For a more in depth tutorial on how to make monograms on the Cricut, I learned from this video. If you’re cutting a full page of monograms, give your machine a minute or two to cut them all out. Since my designs were so ornate, it took my Cricut Explore Air 2 about ten minutes to finish. Then, carefully weed out the vinyl monograms. These monograms are very delicate, so I used this handy weeding tool to minimize the chance of ripping. After you’ve carefully weeded each monogram, you’ll notice how ridiculously difficult it is to keep the letters from sticking to each other. So, either use transfer tape or be patient and focus on gently placing the large middle letter in the center of each glitter ornament. Do not apply pressure, since you’ll probably need to reposition it at some point. Once you’re happy with the placement, push the letters down to lock the monogram in place. It’s also worth noting that less ornate monograms don’t present this problem, so you can always choose an easier font (like Monogramos on Cinzel) from the get-go. Step 5: Add a bow. For the pièce de résistance, add a fun bow! Any ribbon will do, but I used this striped ribbon and this tutorial from BHG to create classic medium-sized bows. Then, I used hot glue to secure them on the top of each ornament. Not only are these perfect for your own tree, they make amazing Christmas gifts, too! Seriously, who knew making glitter ornaments with polycrylic could be so easy?! I’m a big fan, and I see a holiday tradition in the making! I hope you enjoy making glitter Christmas ornaments as much as I did! If you have any questions, feel free to shoot me an email or leave me a comment. I’m happy to help! Oh, and for more DIY holiday inspiration, check out another one of my favorite DIY Christmas decor projects– this fun Merry Christmas Ya Filthy Animal doormat. Merry Christmas and Happy Crafting! They turned out so incredibly well – great job! Sooo cute Stephanie! I’m obsessed with these!